Fuerteventura is a hidden gem. With a temperate climate, crystal blue waters and a laid back atmosphere, it almost feels like the Caribbean! Fuerteventura is the closest Canary Island to the African coast, with only 100km separating the ‘Punta de la Entallada’ on its west coast from Cape Juby in Morocco, and is the second largest (after Tenerife) of all the islands. 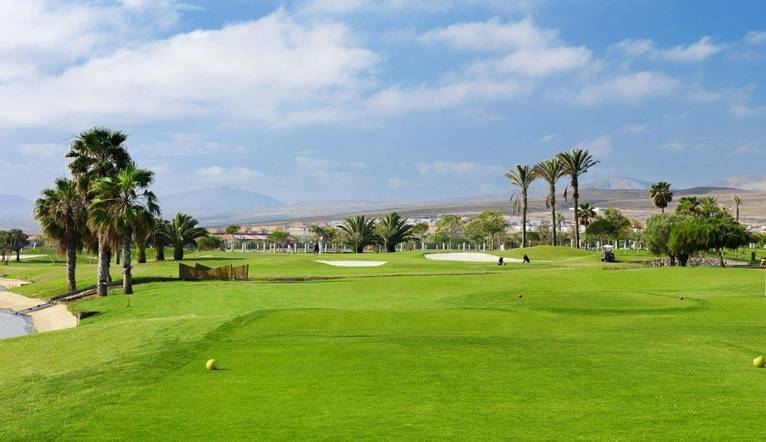 With 3000 hours of sunshine a year, the climate is very similar to Florida and Mexico, which are on the same latitude, making the island a great choice for some guaranteed winter sunshine – perfect for some relaxed holiday golf! Designed by the renowned Juan Catarineau this course offers a fi ne round of golf. The greens are well-protected by bunkers, lakes and streams. There are 2 par 5’s and the rest are par 4’s. The course is generally fl at, with the exception of the 17th and 18th holes. The latter is undoubtedly the highlight - a par 4 dogleg, which drops downhill, offering wonderful views of the Atlantic Ocean en route. Designed by world champion Manuel Piñero, Salinas’ landscape is formed by hills and dunes, which offer protection from the wind. Desert areas and 4 lakes will challenge your technical ability, whilst demanding a good dose of strategy! The 11th is a dogleg right, with a lake running down the middle of the fairway. When approaching the green, we could have both water and out-of bounds to contend with. The transfer time from Fuerteventura Airport to the Elba Sara Hotel is approximately 15 minutes., depending on weather and traffic.